These cues were both built by me, several years apart. The top is a valley supreme cut in half, buckhorn joint collar & buttcap added with 5/16-18 threaded rod as a joint pin. I had no way of accurately tapering anything so I sanded everything as close as I could eyeball it. At this point in time I had no clue a router could be attached to a lathe. There used to be a linen wrap but it was rat-nested & unwound so I look it off. The bottom cue is recently completed. It is an example of years of trial & error and much experimentation. Not to mention, lots of wood has been wasted in the learning gap between these two cues. I'm proud to say that mistakes come much less often than back then & I think I have come a long way. However, my mistakes now cost a whole lot more!!!! Thanks for posting Eric, this is exactly what i was hoping for. Like you said there is a very large difference between your first cue and what you are making now, I mean WOW Thanks for posting Eric, and as you complete more cues please post them. Well here are a few of my cues. The photo's below are some of the early cues I have made. 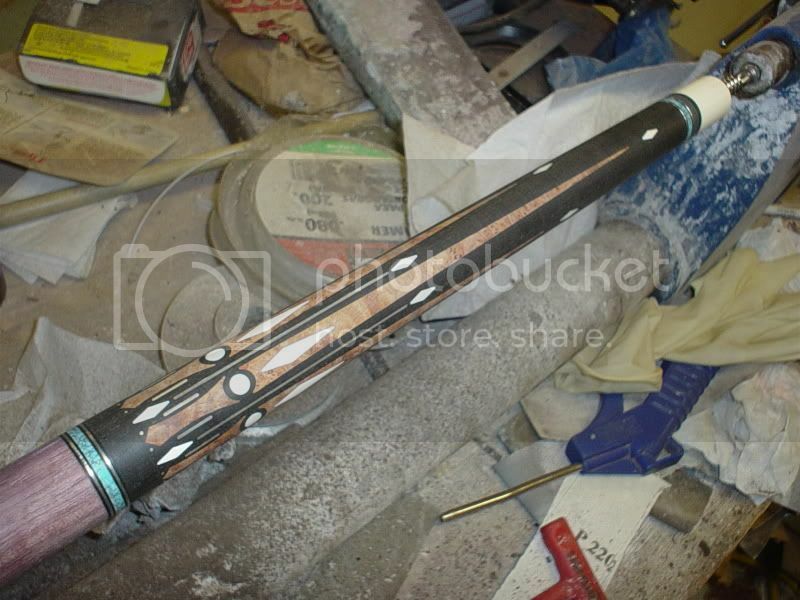 The next set of photo's are cues that were finished in the last six months. I have been building Conversion cues for almost 2 years!!! Last edited by manwon; 09-07-2007 at 05:53 PM. In the game of pool..."mercy does not compute". Here are a few that were completed this year. I will look for some older cue photos when I get home. Chris. Thanks Chris and Joey for postinmg some of your work, I hope to see more in the future. Here are mine. I haven't been at this for all that long. My first cue was completed in January or February of this year. My second cue was finished a couple of months after that. There were plenty in between, but none made it to completion. Made lots of tasty smores with them though. This was Cocobolo with Curly Maple Handle. No points. Finish was CA. This is the only cue I have made with no points and hopefully will remain that way. I prefer to make cues with points. Here is the most recent cue I finished. 4 Purple Heart Points into Bees Wing Narra. 4 Veneers. Linen Wrap. Finish was Automotive Clear Coat. Veneers were Mitered. Here's a picture of that with a close up of the miters. I have quite a few in the works at present and an Inlay Machine that I have still barely touched. 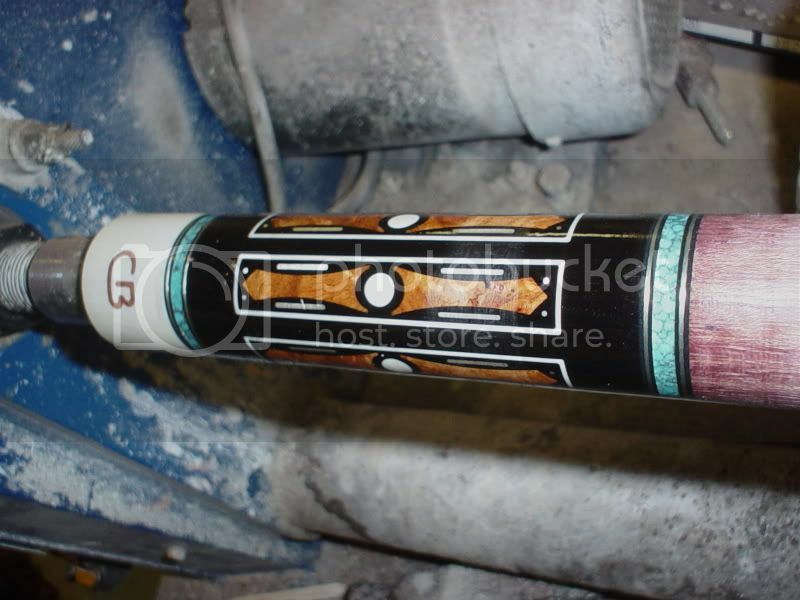 I hope if all goes well to get some inlays in a cue this weekend, but I've been saying that for over a month now. I've gotten some help along the way from a few people here and without it, my cues may very well still look like the first one in this picture. I hope to have more finished up soon. I really like your veneers, they are tight with no glue obvious glue lines. Thanks very much for post in this thread, and please continue to post your new work. Absolutely incredible Edwin Reyes cues. Bandido!! You da man!! I would love to read a little philosophy along with the pictures. and the second one is a stack leather wrap? Coop the grey curly is resin impregnated wood from wildwoods. 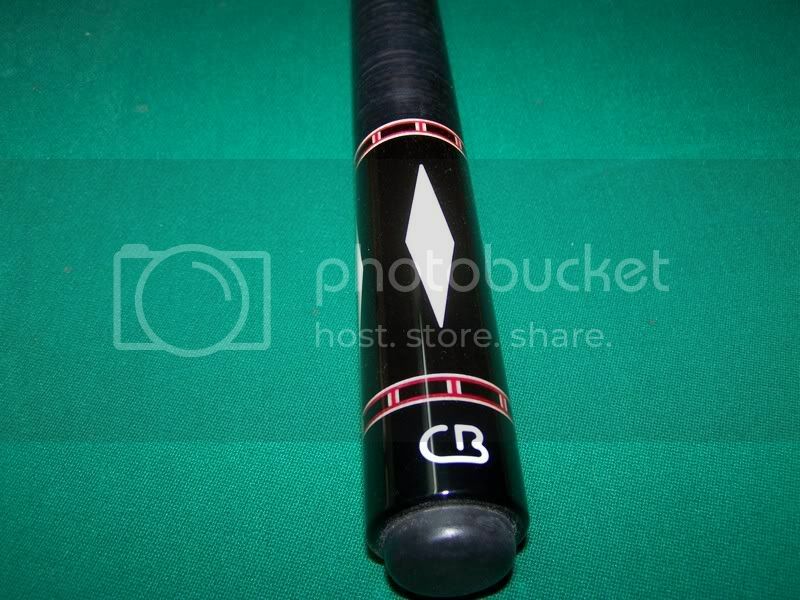 The middle cue does have stack leather. I was using that cue as my personal player for around 6months, I prefer the leather to have some texture to it. 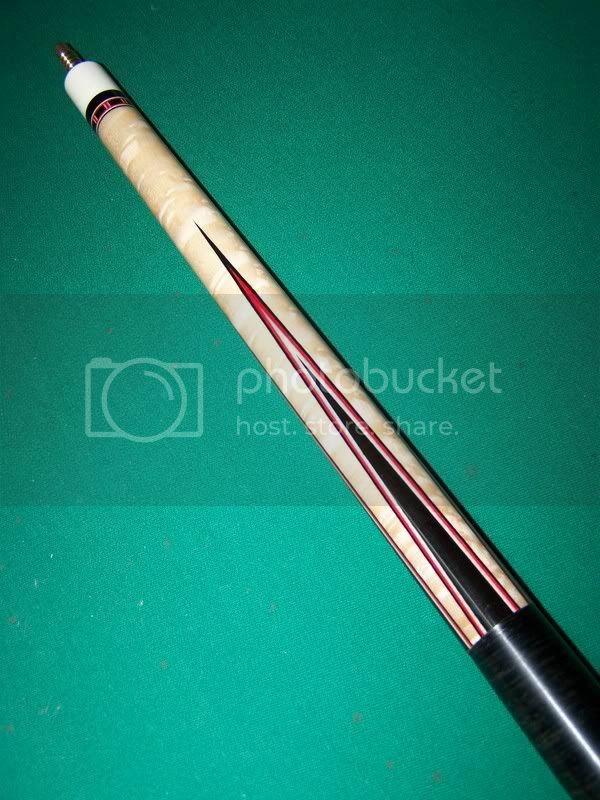 The top v point cue also has stack leather on it. That one is polished up as per customer specs. I prefer mine between flat smooth and suede feeling. 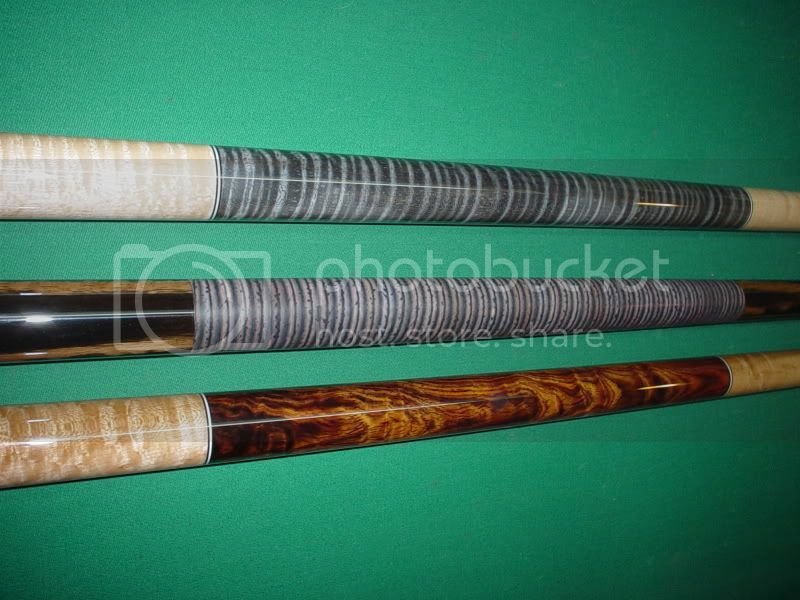 I just sold the ebony cue I was using to a local player who needed a cue that night. 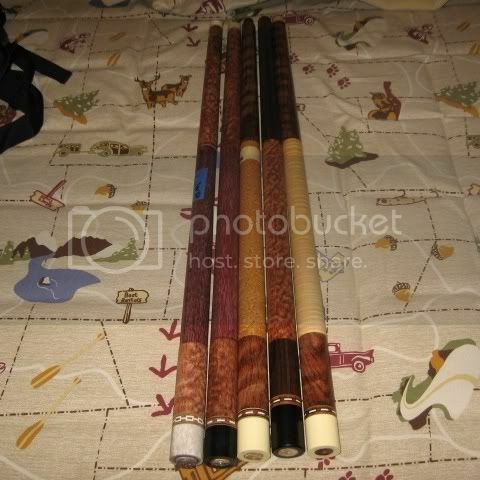 I really need to make a cue so ugly no one will want to buy it, I keep selling my own cues. Oh well I could have worse problems. Chris.